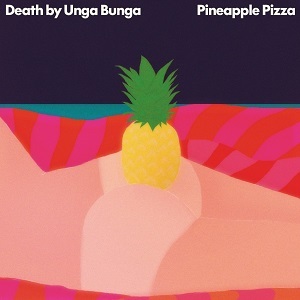 Death by unga bunga are a 5 piece rock band from Moss, Norway. They're a hard working band - this is their fourth album in five years, and with plenty of live dates in between recordings that's a busy schedule. This is their first album to be released in the US. The album kicks off with "Dollar slice" which sounds like something from the Shadows, but it's not representative of the rest of the album. Once you get to the second song then their real sound starts to show. It's garage rock with influences from The Ramones, Cheap Trick and a whole heap of 60s pop and 70s rock bands. It's amazingly catchy stuff - check out the video for "Lady Fondue" and hear for yourself just how good it is. "Pineapple pizza" is out now.